This is the front cover of the Tory manifesto, which you can download here. What can we deduce from this? The Tories are a team, and that team includes lots of women and at least one minority face. You don’t recognise most of the team, apart from Cameron and May, though perhaps after five years as Chancellor, we can spot Osborne from the side of his head. Also, running the country is no laughing matter, although the merest hint of a smile is starting across Cameron’s face, presumably in recognition that the economic recovery is finally taking hold. 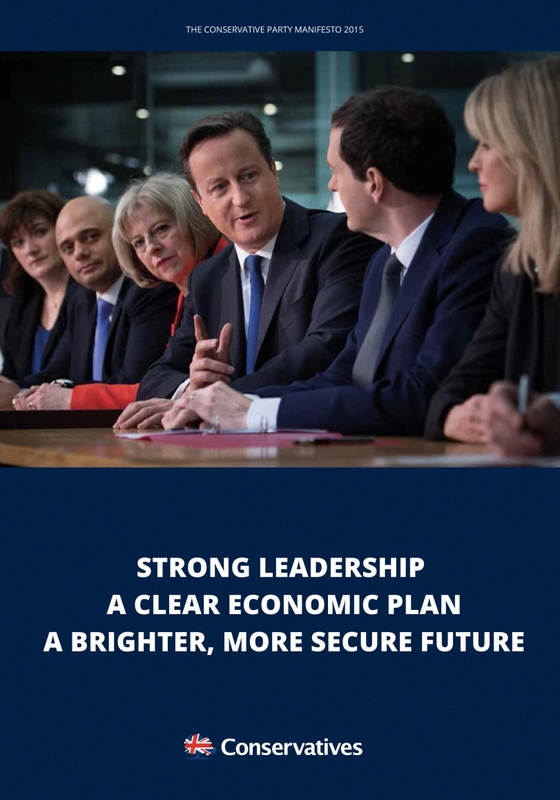 Ther’s a bit of text too: strong leadership, clear plan, brighter future. Happy days are here again, if only we can stay the course. 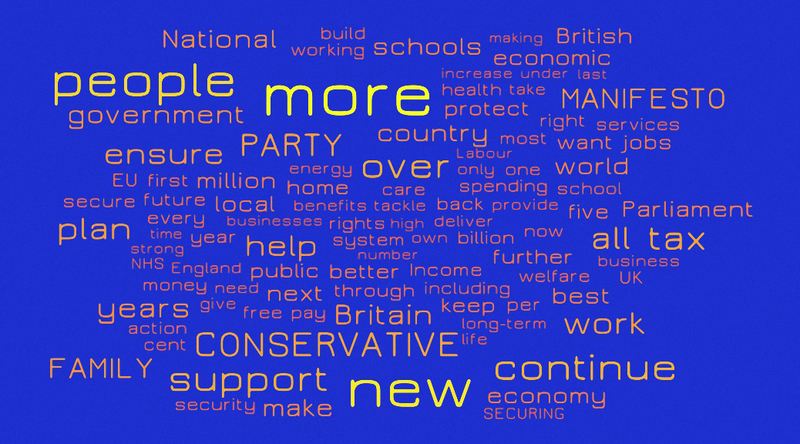 And here is the word cloud: more, new, people, continue, ensure, support, tax, all. Make what you will of that. There’ll be more for all if we continue. Here is the cover of the Labour manifesto, which you can download here. I really don’t like this one, it looks like a Soviet or Mao-era Chinese communist poster, something reporting progress on the five-year-plan. Still, with Milliband and Balls fronting their campaign, it was probably wise to steer clear of the head shots. The second sentence is also subjective (“better”) and includes a contradiction – how do you both reward hard work and then share the prosperity it brings with someone else? 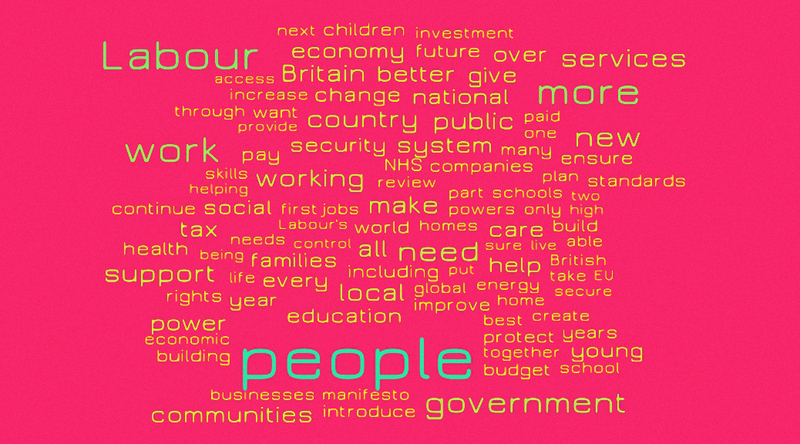 Here’s the Labour word cloud: people, need, support, more, government, public, services. No need to read between the lines here. 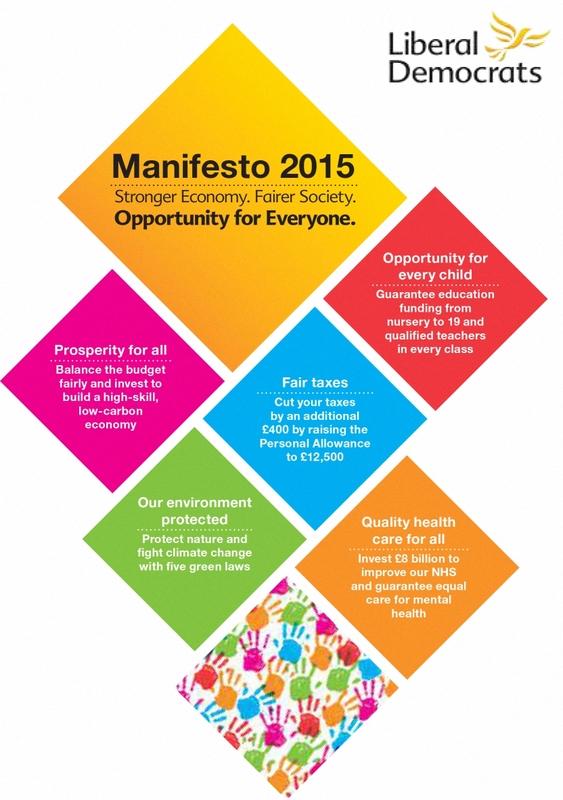 This is the cover of the Liberal Democrats manifesto, which you can download here. Another one that doesn’t use a picture of the leader, presumably because they’d like people to forget that Clegg is still in charge. This one seems to be suggesting that a lot of jigsaw pieces need to fit together to make a successful country, and a rainbow alliance of pieces, too – it’s surprising that so many of the other parties colours are in there (albeit, pastel, watered down versions). Or perhaps it’s a signal that they are prepared to enter a coalition with anyone, so long as they moderate their views a bit under the Lib Dem influence. 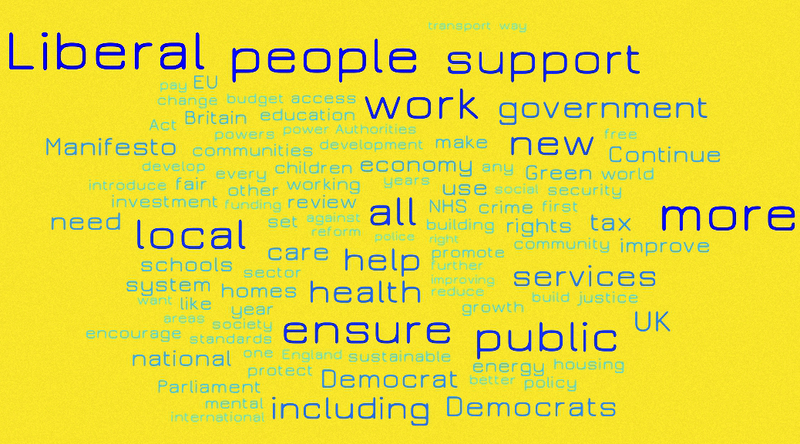 Here’s the word cloud: ensure, all, people, support, more, local, public, work. A consistent message, but not for me. 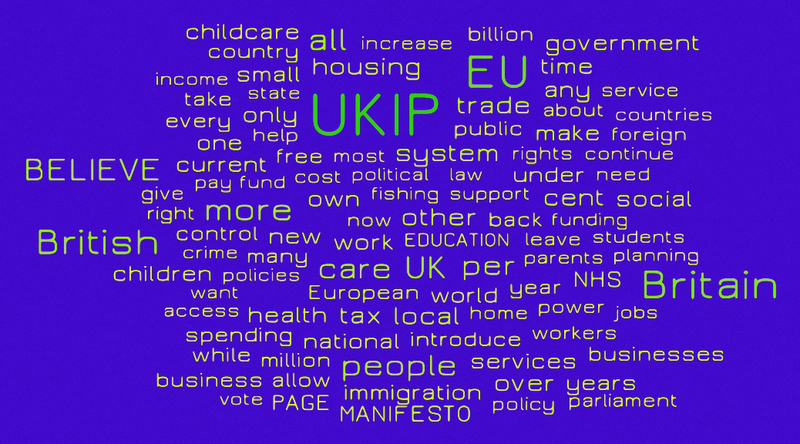 Here is the cover of the UKIP manifesto, which you can download here. And is the third of four without a picture of the leader on the cover. Considering the relative popularity of Nigel Farage to the others, that’s a real surprise, but perhaps they don’t want to be seen as a one man band. They have the next best thing, though, a quote from Nigel. 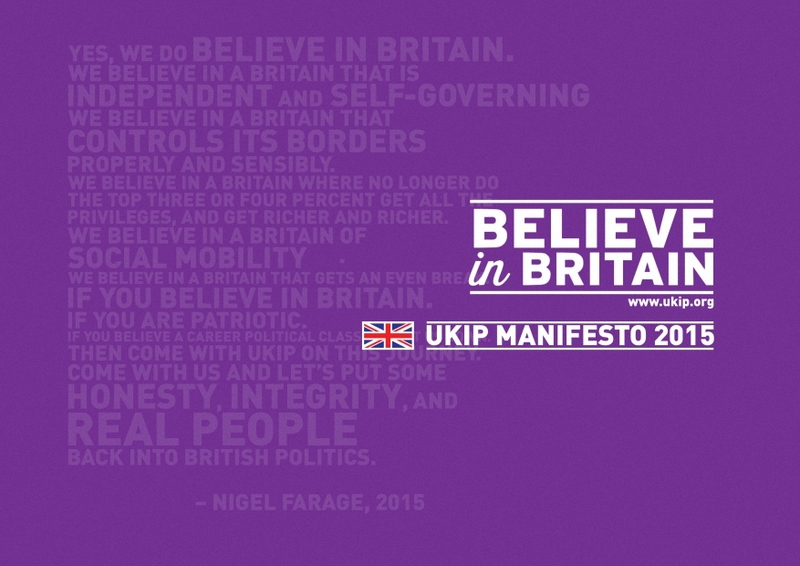 Admittedly, it’s so faint that it’s difficult to read, so let’s start with the headline – believe in britain. Fair enough, I do, or at least my bit of it – not so sure about the fringes. The quote covers independence, border controls, social mobility and patriotism, and rails against the political classes. I can go for all that. Here’s the word cloud. This is probably the least clear so far. Apart from Britain and British and EU, lots of things seem to have been given equal weight. Maybe this is a good thing. At a stretch we can get: all, British, people, care, more. And perhaps they do. 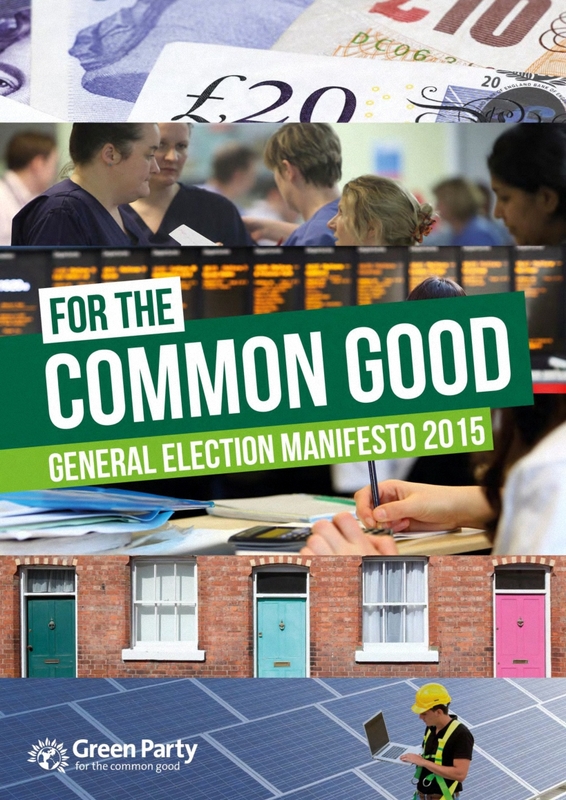 This is the cover of the Green Party manifesto, which you can download here. We’re back to pictures, although this one is a bit of a dog’s dinner. The party has sensibly avoided illustrating its joint leadership, who like me have a good look for radio. What we have instead takes in money, hospitals, trains, office work, houses and industrial scale solar panel installation. I have no idea what to make of all that. But it’s for the common good, whatever that is. 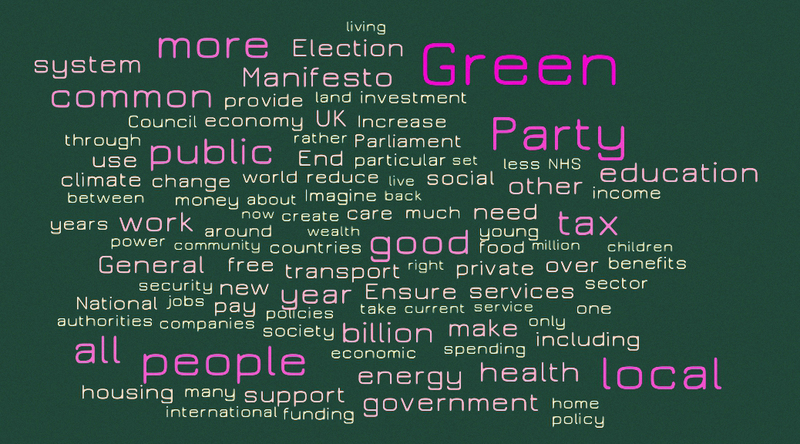 Here’s the word cloud: all, people, more, good, local, good, common, public, tax. And lots of other things. That’s probably as much as we need to know. 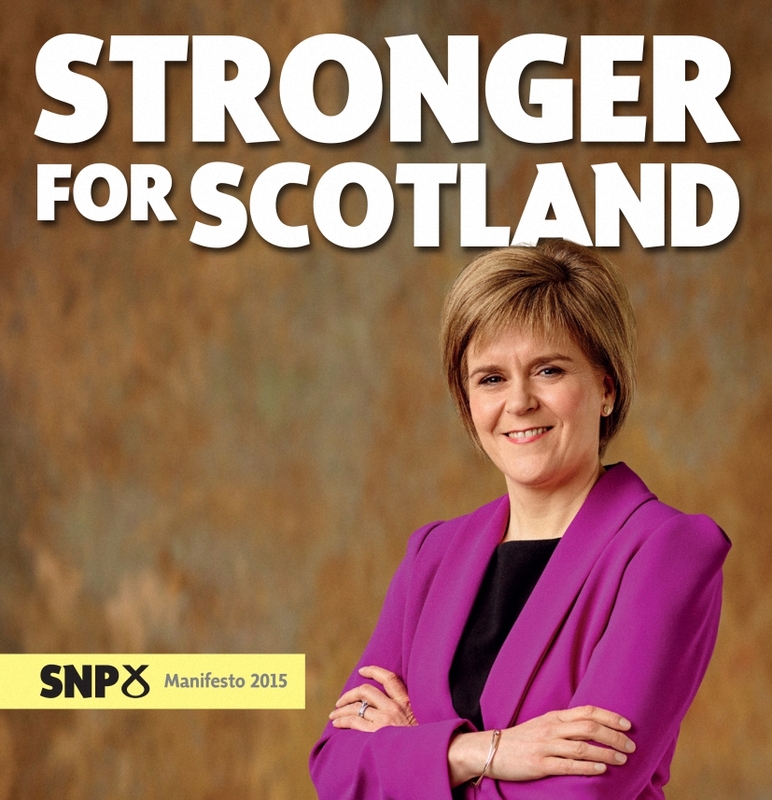 Here is the cover of the SNP manifesto, which you can download here. We’re back to pictures of the leader (only our second out of six), but this time alone against a meaningless background. This is the most presidential of the lot, and from someone who is not even standing as an MP in the election. It’s amazing to think how much airtime has been given in England to what is essentially a foreign leader. I’m afraid I find this one a little scary. Sturgeon strikes me as a cross between the “message from God” zeal of Tony Blair and the “mother knows best” shtick of Angela Merkel. There’s a real whiff of Big Sister, the Borg from Star Trek and even “tomorrow belongs to me”. Ugh. 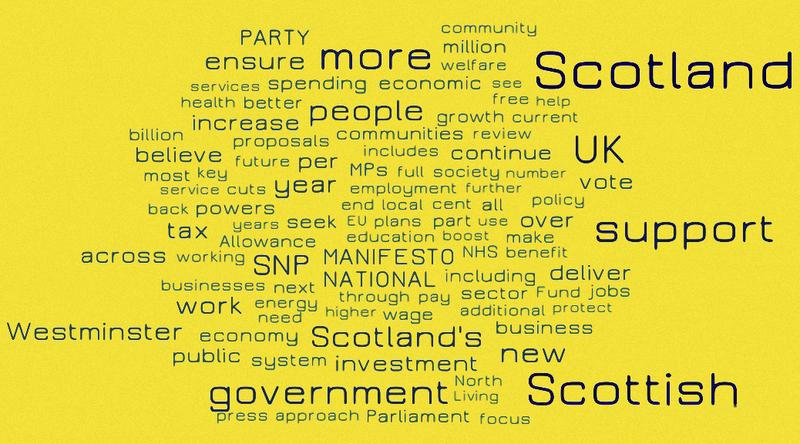 Here’s the word cloud: Scotland, Scottish, Scotland’s. What did we expect? Also: more, UK, people, government, Westminster. You know what will happen.